The main components of the system are the CINE TAPE MEASURE CONTROL and the SENSOR ASSEMBLY. The control displays accurate distance measurements from the constant stream of data that is received by the sensors. 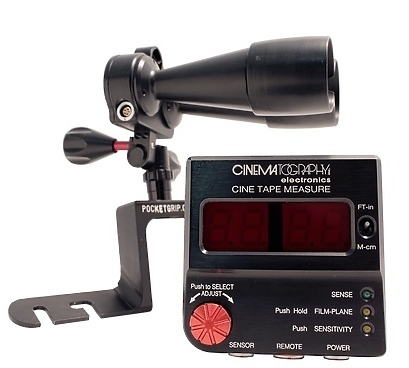 CINE TAPE MEASURE System is a small, rugged, lightweight, and quiet ultrasonic range finder. It is compatible with all lenses, film cameras and video cameras. In addition, the system is easy to set up and use, making it the first choice of professional filmmakers. The stylish Cinematography Electronics CINE TAPE MEASURE CONTROL is the brain of the system. It continuously computes the distance between the camera's film plane and the subject. A simple one-time Film-Plane offset adjustment programs the relationship of the film plane to the sensor position. When the control detects a subject, the green Sense LED glows and the calculated distance is shown on the LED display in either feet-inches or meters-centimetres. Adjustable brightness levels for the large red LED display offers comfortable viewing under different lighting conditions. The digital Sensitivity adjustment feature fine-tunes the system range, which is also helpful with different subject reflectivity. The Close Focus feature sets the minimum sense distance. Objects within this area are disregarded. All of the functions are set and stored digitally, which safeguards against accidental changes and provides accurate repeat-ability between units. The innovative Cinematography Electronics SENSOR ASSEMBLY consists of two small cone-shaped "horns," a miniature pan tilt mechanism, a mounting stud, and an electrical connector. The horns send and receive ultrasonic signals that are used to calculate the distance measurement. Mounting the SENSOR ASSEMBLY onto a camera package is simple with the combo stud. With its pan and tilt adjust/lock knobs, aiming the horns towards the subject is quick and straightforward. The SENSOR ASSEMBLY interfaces to the control via a short detachable Sensor Cable. A spring-loaded holder permits laser pens to be attached parallel to the sensors, providing a visual reference during calibration. The Cinematography Electronics REMOTE CONTROLLER, used in conjunction with a CINE TAPE MEASURE, provides a second distance display and two adjustable near-far distance limits, with displays. The REMOTE CONTROLLER’S stylish enclosure also duplicates all the control functions of the CINE TAPE making it simple to make adjustments from either unit. It also adds a SYNC function for use when two CINE TAPES are on the set. Hire the Cine Tape Measure from Procam. Best service and rental rates for the Cine Tape Measure and all cameras, lenses, sound, lighting and grip.